August is one of those months that seems to creep up on me every year, and then slip away just as quickly. Maybe it is because it lacks a major holiday, or that as a child it meant that summer was ending and school would soon begin. Whatever it is, August has a feel like no other month. Primarily hot, but something less tangible too. Hey, did you know that other than leap years, no other month will start on the same day as August? I just learned that on Wikipedia so it must be true. Seriously though, look on your calendar and note on which day of the week August begins (Sunday in 2010). Then scan the other eleven, and you'll see that no other month begins on that day. Neat, huh? August is also a time of plenty. From tomatoes to corn, peaches to early apples, and all sorts of things in between, fresh fruits and vegetables seem to be abundant pretty much wherever you go. 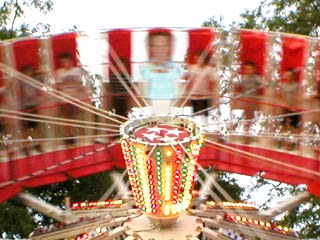 State and county fairs typically take place in August as well. If you've never been to yours, you should check it out. County fairs and carnivals, no matter where they are, harken you back to a simpler time. Check out the 4-H animals, feast on some cotton candy, and hop on a tilt-a-whirl that looks like this ride will surely be its last. Or take in a summer festival, like the All-American Soap Box Derby in Akron, OH, the Newport Jazz Festival, or even the Belly Dance Festival in Snowbird, UT. I don't normally miss that last one, and even participate in the amateur open event. But I am still nursing some injuries I suffered in a bull encounter in Pamplona earlier this year, so I'll have to skip it. Or maybe just take one final getaway at a timeshare rental before September arrives. You could hit a ski resort town like Whistler, BC or Stowe, VT, and enjoy the mountains, lakes and streams, sans the crowds typically associated with these destinations. Or how about Maui? Sure it's hot, but it's hot where you are too, right? You might as well be hot in Hawaii. But if the heat is a deal breaker, how about a Las Vegas timeshare vacation? It's probably 120 degrees outside, but you'll be too busy inside casinos, theaters, galleries, museums, and five-star restaurants. As for me, I am packing my bags for the Hyatt Grand Aspen in Colorado. Our members give it five stars, and I cannot wait to see for myself. Something tells me the county fair in Aspen is going to be more of a sushi and goat cheese affair, rather than BBQ and sweet corn, but we'll see. By the way, August is National Goat Cheese Month in the U.S. as well as being Psoriasis and Cataract Awareness Month. You gotta go goat cheese there.